Abstract: Cast aside the i850E chipset and RDRAM which have gone the way of the dodo, and the new king of the hill is clearly Intel's i875P chipset a.k.a. "Canterwood." While DDR memory crept into mainstream Pentium 4 systems in 2002, back then users looking for top of the line performance still had to go with RDRAM. The i850E/PC1066 RDRAM combo held the performance crown for most of last year, but in 2003 things are turning out to be totally different. Cast aside the i850E chipset and RDRAM which have gone the way of the dodo, and the new king of the hill is clearly Intel's i875P chipset a.k.a. "Canterwood." As for the actual performance and architectural differences between the i865PE and i875P which runs with DDR memory, we'll get to that in just a bit. Intel had previously road mapped the Pentium4 from 533MHz FSB to 667MHz with the "Springdale" chipset. Springdale-based motherboards were originally expected to support 667/533/400MHz FSB Pentium 4 processors, but with Canterwood everything has been shifted towards 800MHz FSB. These changes were announced on November of 2002 during Comdex Fall 2003, much to the surprise of motherboard manufacturers who had many 667MHz FSB Springdale motherboards actually on display. When we take into account AMD's recent rise to 400 MHz FSB, Intel's mirroring of this bus speed change in November of last year now makes more sense. 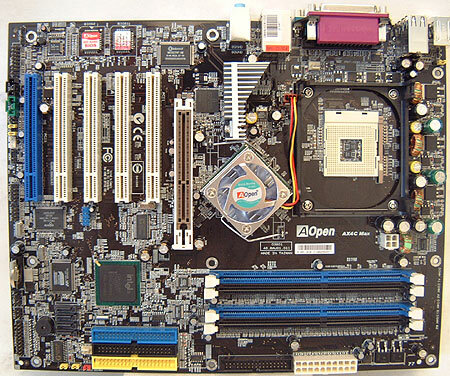 Today we're going to examine AOpen's flagship AX4C-Max Pentium 4 motherboard which is based on the new i875P chipset. The AX4C Max comes with a lot of features that deserve as much mention as the chipset itself, including such items as Gigabit LAN, 5.1 audio, Serial ATA/Serial ATA RAID (ICH5R and Promise PDC20378), IEEE 1394 firewire and dual BIOS's. The AX4C Max includes five 32-bit PCI slots for future peripheral expansion as well as an 8X compatible AGP port for the gaming junkies out there. The four 184-pin DIMM slots will accommodate up to 4GB of PC2100/2700/3200 memory as well as ECC DDR RAM for those of you considering using the motherboard for workstation situations. With the switch to i875P chipsets it is important to mention that the AOpen AX4C Max only supports Pentium 4 processors which run on a 533 MHz or 800 MHz FSB. Users with 400 MHz FSB Pentium4 (Williamette or Northwood) and socket 478 Celeron processors are simply out of luck. We've been pleased with the way AOpen organizes the layout of components on their motherboards, and AX4C Max is no exception. The main ATX power connector as well as the floppy drive are located in an ideal position to the right of the DDR DIMM slots. The auxiliary ATX12V line is also placed in good spot near the top of the motherboard just left of the DIMM's where it is unlikely to get in the way. With more and more USB devices on the market, two USB ports is often not enough which is why we're happy to see that the AX4C Max places six USB 2.0 ports on the back I/O panel rather then relying on riser cards. Having the option for a riser is great, but we'd prefer not to waste a PCI slot for that.